I woke up somewhere new and didn’t trust my body clock. For seventy-nine years it’s woken me at the same hour, yet this morning I checked my watch. Is it time? I got up in a hot, dark room with old air-conditioning rattling its swan song. And it was wonderful. It was wonderful because the smell of the air was exotic, and through a crack in the heavy curtains I could hear the splashes of hot sun streaming across buildings, bubbling down the streets, washing over people and cars, sparkling on roof tiles and on the leaves of trees, and occasionally the spray fanning in through an open window would leave tiny droplets on wooden boards, broken plaster, a table top, or a piece of blue cloth, of a shirt, or a dress hanging on a door. It was wonderful because, for this day, everything I experienced would be new to me. How beautiful is Havana? Is there any where on earth like this? After Breakfast I moved to the terrace in front of the hotel with a small bottle of water, (the large ones can be heavy to carry), and I sat in my linen suit and Panama hat, watching the people go about their morning business and trying to get my bearings. The sea and Florida must be up to the left. I thought I’d walk that way first. But just for a moment I hesitated, snagged on a passing thought: I’ve come here to die; I want to end my life on an adventure, but part of me is scared (not so much that I can’t look on in wonder), but this is my last day; it’s now. Until I left the terrace I’d been a spectator. And with one step I was swallowed by the beast and swept along by a wave. I was suddenly a part of this living, breathing thing. I was a part of Cuba. And now the people were alive, the cars were alive, and the air was alive with brand new noises and tastes and smells. And I am alive, slowly walking, already sweating a little, down the paved centre of an avenue called Prado, towards the sea. What sort of trees are these? I would have always liked to have known about trees. And what sort of stone is this under my feet? I don’t know about stone either. And the buildings are alive. Like me they are old and crumbling. But they have the greatness of having survived. Maybe if they were to fall tomorrow, today would have been their finest day. This could be the pinnacle of their existence as some how today is mine. People hissed at me as I passed, and I thought they might be booing me like a bad character in pantomime, but in Cuba hissing is just how to get someone’s attention. Girls called to me in Spanish, they were friendly and good humoured. An older man waved a bunch of home made cigars in front of me. I smiled and he let me pass. The air is thick and warm but the sky piercing blue. Sometimes you and I used to walk through the park arm in arm. I loved the avenues of trees and the feeling of you close to me seeing the same things I did. I remember the day we were caught in a rainstorm and sheltered under a tree, what an adventure. I wish I’d learned about trees. You always wanted to learn a language. Imagine if we’d learned Spanish and were here together and could talk with people. Now that would be something. I never quite got used to it becoming hard to walk. I used to think I was just having a bad day. I never thought I couldn’t walk any more, or that I should cut down on my walking, I can still walk now. How long has it been? When did it become hard? After you had gone Maude, maybe ten years ago? But I’m still walking the day I die. But I didn’t think that Prado would be so long and I needed to rest for a moment. I’d misplaced my water. I must have left it on the terrace of the hotel. I found a bar with table sheltered by umbrellas and I drank a beer called Crystal and a young man joined me at my table. You English (?). It was part question and part statement. Yes, I am. I nodded. I don’t speak good English. He was opening a conversation. Your English seems very good to me. You like langosta? You know lobster. You like lobster? You want to come and eat lobster. My friend make it for you. My friend make good lobster. You come to her house. Is cheep. Oh. Thank you. I’m, I’m not hungry though. You come later. Is cheep. You know in hotel it twenty five dollar, thirty, thirty five dollar. Is not good, my friend make good Lobster and cheep. Half, less than half price. Um, maybe later I’ll come. Early this evening perhaps. OK. Where you go to now? You want I show you the cigar factory. Down that street. My uncle work there he get you cigars, good cigar, Romeo and Juliet, Monte Christo. Good cigars. I just want to walk to the sea thank you. I’m too old for cigars. Maybe I’ll come for lobster later. You come here at seven? You take taxi? You remember the name of here: Terrace de Prado. Eh, you speak good Spanish. My friend stayed while I drank my beer and told me a thousand things about Havana. And I bought him a beer. Then his sister came and joined us. She spoke no English. After a few minutes I told them it was time for me to leave. You OK? You want my sister come with you? Show you Museum of the Revolution. Show you La Habana Vieja. 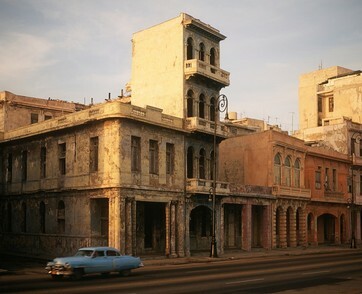 Old Havana? No, I’ll just walk by myself thank you. But I will come for lobster this evening. You come for Lobster? Here? At Seven? He turned and said a few quick words to his sister. They were very pleased. I stood up and he shook my hand and she kissed my cheeks. You remember the name here. Terrace de Prado. I was pleased too. No one I know would have come here. No one I know would have talked to strangers. I wouldn’t. I’ve never done this before. Later I would go back to the Terrace de Prado and I would eat Lobster. Maybe my guides wouldn’t be there. They might not believe I’d come back, there must be many people who say they will but don’t. I’d be back for more though. This is my first experience of the Caribbean and I’m getting a taste for it. And you Maude (come into the garden Maude); would you have liked my adventure? Would you have liked to share my last day? I would love you to be here and see all this. Can you imagine how far from home I am? I wish you were here too. I think that the beer quickened my step; I was at the sea in no time. The water came up to the rocks below the sea wall then there was a long road running along the gentle curve of the bay. Whole buildings are missing along that road. Simply fallen down through lack of repair. One can see into rooms where a wall has crumbled away. Some buildings are held up with wood and ropes. All the walls are painted so many different colours. Occasional green and in the distance a light blue. But such a palate of yellows, cream and ochre and a hundred other tones I have no name for. Waves crashed hard against the sea wall splashing forty feet in the air then pouring down onto the road. A man on a bicycle pulling a wheeled seat swerved to avoid the downpour. He called to me to see if I wanted a lift. He took me to my hotel for a dollar, but I gave him two. I sat again on the terrace of the hotel. I bought a bottle of water and a ham and cheese sandwich. I wonder if it is just this hotel which sells such awful food; you would think it hard to go wrong with a ham and cheese sandwich. But it just adds to the adventure - absolutely nothing is the same here; even the things which are the same are different. I had a cup of tea with strange tasting milk and the afternoon was suddenly drifting away. I had a moment of anxiety. I am in the place in the world most removed from anything that I know. My life is about to end and I am sitting in a hotel drinking tea. Don’t waste the small bit of life you have. Then I reminded myself that this is my choice. This isn’t a waste; it’s my ideal. This is my perfect day. The heat and the time passing, gave me the idea of taking a tour of Havana by taxi. It would be nice to have a few weeks to explore. It would be nice to explore the whole of Cuba, and come to think of it there is an entire planet to see. I’ve only visited a fraction of this world. There is so much in life to experience. You can sail the seven seas to every land, or spend your time watching flowers open and exploring the stones in your garden. You can be an academic and study the world from a book, or a philosopher and unravel the complicated conundrum of life in your head. My life was spent being in love with you, I did other things as well, but I chose you as my primary occupation. Now I am exploring, but only as a little taste. I don’t wish for another ten years to explore; it would be nice, but it’s not my first choice. My first choice is you. My time is now. Tonight I will die. This afternoon I will see Havana by taxi. I bought two bottles of water, and a man walked me the six yards from the terrace to a taxi - a blue Lada twenty years old maybe. My driver spoke only a few words of English but we spent the afternoon laughing at our clumsy attempts to talk. We saw so many places; I remember so few of the names, it’s sad. We saw squares, statues, and huge palatial buildings, buildings for government, arenas, theatres, hotels, and hospitals. And suddenly we were flying. We flew above a maze of tiny streets of crumbling houses, babies crying, people fixing cars and children playing baseball. We flew above the proud and the humble, the good and the bad. We flew over a factory and we flew above a bus with 300 people in it, my driver told me. 300 people, it’s called a camel he said. My dream wasn’t clear, just images and snapshots. But I dreamed you were holding my hand and we looked down on Havana and we were dancing through a crowd of people. So much was happening around us but you and I were dancing. You kissed me below my ear. I have to go now, you whispered, will you come with me? We were out side the hotel and my pilot and guide was carefully waking me. The further I get through life, the more I feel the need to sleep in the afternoon, I shouldn’t be surprised that I slept today. I went to my room and sat for a while trying to remember the dream, not quite able to focus. I washed, changed my clothes and then began the slow walk along Prado. I arrived at the Terrace de Prado and found my friends sitting at a table with several other young people. They spotted me and came over, and then we engaged in a sort of polite dance where no one did anything for fear of upsetting the other. Shall we sit and have a drink? I asked. Yes a drink would be good. Let’s sit down. Could you recommend a drink for me? I’d like something Cuban. Something I’ve never had before. What’s good? Ah, yes. You drink Mojito. You try, you like. I had the impression that convincing a tourist to let you be their unofficial guide was a prize so rare that having won it no-one knew what to do with it. Conversation was stiff. They were watching my moves, trying to workout if they were doing the right things. I felt as though I just had hire friends who would agree with me whatever I said and laugh at my jokes even if they weren’t funny. I drank quickly and suggested that we go and get some food. I hadn’t eaten since my lunchtime sandwich and was starting to feel quite hungry. Yes, said the man, You want to go eat? Thank you, that would be good. Ok you go with my sister she take you to restaurant. Restaurant? I had thought we were going to someone’s house. Are you not coming with us? I asked. No, I don’t come tonight, I see you later. I see you tomorrow. You go with my sister she take you. OK? I couldn’t decide if I had the right to feel a little confused. We left the café and set off down the street. The girl walked several yards ahead and much as I tried I couldn’t keep up. Soon I was out of breath and uncomfortable. The girl looked shifty and came back to me. She’d said several things before I realised that at least some of the words that she was saying were English. You no walk me. She shook her head a lot showing me ‘no’. Police no like. No. Then she struggled finding some international gesture to communicate the idea that I was supposed to walk a way behind her so that no-one could tell she was with me. And then the pace slowed right down and the walk became easier. We turned from the main road and entered the maze of tiny back streets. My wish to be relieved of control over my evening was granted with remarkable rapidity. I was lost and following a strange woman, who spoke no more than a handful of words in English, down the back streets of Havana in the early evening. Was it naïve of me to feel no fear? People watched me as I walked, but now no one spoke, though some smiled. The woman waited for me at the door to a house and then walked in and up some narrow steps. I hesitated and she beckoned me to follow. As we went up my guide called out and we were greeted at the door to an upper room by a sturdy woman in her forties, who shook my hand. The room had a table and four chairs in the centre and sofa against one wall. On the table stood a large iguana. It was motionless and I stared at it and it stared back. One of the women picked it up, kissed it and then threw it onto the sofa from which it carefully lowered itself to the floor and retired to a corner. The tall windows opened to a balcony overlooking the street, a scattering of ancient American cars and a group of kids playing soccer. The inside walls were covered in graffiti in a thousand different languages. - Lobster? I was asked. I ordered lobster for me and for my guide and I asked for beer for all of us. Then the older woman disappeared through a door and made sound of food preparation. Maybe I was still tired, perhaps I was hungry or it could have simply been the alcohol but the evening lost its clarity. I waited for an hour for my food during which time I was introduced to the lizard, taught to salsa and engaged in charming conversation, not a word if it in English, whilst looking out over the balcony on the gently closing evening. First came deep fried, salted banana slices and a glass of mango juice, and then a sort of lobster stew served with rice. The food was simple yet alien. It occurred to me that this was my last meal and I savoured each mouthful. I thought of you, and though I’d watched you eat a thousand times, trying to imagine you here faded in to a memory of eating with you the night we got dressed up and went to the theatre in London and we told the waiter that it was our wedding anniversary. I remember how you looked at me. My guide seemed restrained, following my pace mouthful for mouthful. Halfway through the dish she stopped eating. A teenage boy came up the stairs and introduced himself to me. He spoke good English and helped unravel my mysterious evening. A restaurant in a house is called a Paladar, there are many around Cuba. The man who had first introduced himself to me in the Terrace de Prado had gone to work in a club. The writing on the walls was of content guests. My guide was saving half her food to take to her son who is nine. They had not eaten meat or fish for over a month. I paid the older woman leaving a few extra dollars and then I was led to a room with just a bed and a shrine to the virgin Mary. My guide pulled from under the shine something covered in cloth and sat on the bed beckoning me to sit too. I sat down and the cloth was unwrapped to reveal two boxes of cigars. The boy explained that I would like to buy them for fifty dollars each. I told him that I didn’t smoke and he reminded me that I would like to take them as presents for my friends and family. They were worth over two hundred dollars at the factory. I could go and look tomorrow if I wanted. For a moment I determined to not to be forced to buy something that I didn’t want and then I looked at these people who had helped my adventure, their smiles. The food saved for the son, and I decided that today I would start smoking. I bought I box and gave every one a cigar. They all seemed happy. I would like to go to my hotel now. I said. Could you help me get a taxi? The boy ran out of the room and came back a few minutes later. I said goodbye to the smiling women who both kissed my cheeks and wished me many things in Spanish I lift them my cigars and then followed the boy out into the street where I was ushered in to the back of a big old car driven by an unshaven man with a moustache. He will take you to your Hotel. Said the boy. And he did. As I climbed out of the car I was greeted by a beautiful young woman, or girl, in a black dress with three buttons undone revealing a crucifix. She took my arm and spoke to me in perfect English. How are you? Have you had a good evening? She asked. I wondered if she was something to do with my hotel. I’ve had a lovely evening thank you. And now you would like to come and salsa with me? Oh, no, thank you, I’m too old to salsa. Then maybe you would like to come and walk with me. No, thank you, I am too tired. We can go and have a drink in your hotel? No, thank you, I’ve had a long day. In my country it is nearly morning. I must go to my room. standing facing me now with one hand on each of my elbows, imploring me with huge brown eyes. And it didn’t even seem like a show. I think she just genuinely wanted some money and would offer whatever service necessary to get it. I’m sorry. I’m going alone. I smiled. Maybe you will see me tomorrow? No, I’m sorry, thank you. I knew she was trying to sell her self to me, but I felt genuinely charmed. I started to walk to the door of the hotel and she took my arm for the three or four remaining steps. Where did you learn to speak English like that? I asked. In the street. She said. She never stopped smiling. Then kissed my cheek and said, ‘Sleep well,’ And walked away backwards, a doorman held the door for me and the girl was gone. I bought a bottle of water and went to my room. I have had my final day. The adventure is over and I’m satisfied – I want nothing more. And now I’m in a hotel room thousands of miles from home writing down details, gently and nervously delaying what I am ready for. The room is hot, and the air conditioning is noisily redistributing the same old air. I’ve had an amazing day. I have seen new wonders through brand new eyes, and everything seems so rich and beautiful. What a fine time to have as my last. And you Maude, I love you still and forever.